Cooling, clearing and reviving. Steam distilled from the fresh leaves, the fresh, minty-fresh fragrance of Peppermint Essential Oil is universally recognised and loved. Inhaling a few drops on a tissue quickly revives head tension and is an aid to concentration, especially whilst driving or travelling. This method is also ideal for clearing blocked sinuses or easing travel sickness and jet lag when you are out and about. After a busy day, a few drops of Peppermint Essential Oil in a footbath will cool, soothe and refresh tired, aching feet in a way that absolutely no other natural remedy can! In massage blends it is a great muscle relaxant that eases general muscular aches and pains and stiff joints, which is why it is valued so highly in sport therapy. Peppermint also eases a wide range of gastric problems such as nausea, indigestion, stomach cramps and spasms when massaged on the abdomen. 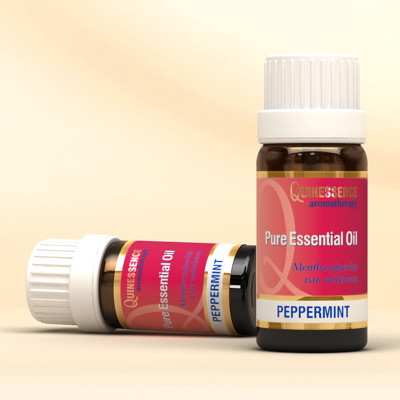 The clearing, antiseptic and anti-infectious properties of Peppermint Essential Oil are particularly suited to the relief of colds, flu and catarrhal congestion, whilst its stimulating action helps overcome general fatigue and burn-out. Peppermint is a highly adaptable and effective essential oil, but it is extremely powerful and should be treated with respect. Only a very small quantity of this oil is needed to receive its benefits. Do not use on children less than 3 years old, and keep the undiluted oil away from the nostrils of babies to avoid the possibility of apnoea. Menthol, menthone, iso-menthone, menthofuran, menthyl acetate, 1,8 cineole, limonene, a-pinene, b-pinene, b-caryophyllene, pulegone, piperitone.